Our research makes use of maize (corn, Zea mays L.) as a model genetic system to investigate fundamental questions of inheritance and the nature of genetic material at the cellular and molecular level. Specific research areas currently include (1) the role of telomeres and the nuclear envelope-associated LINC complex in meiotic chromosome dynamics and segregation, (2) the functional genomics of chromatin structure and genome response using DNS assays, and (3) G-quadruplex/G4 DNA and guanine modification in gene regulation associated with energy stress. Experimental approaches include classical genetics and molecular biology, 3D fluorescence microscopy, structural genomics, functional genomics, and bioinformatics. For links to our research articles, visit the Bass Lab Publications page. 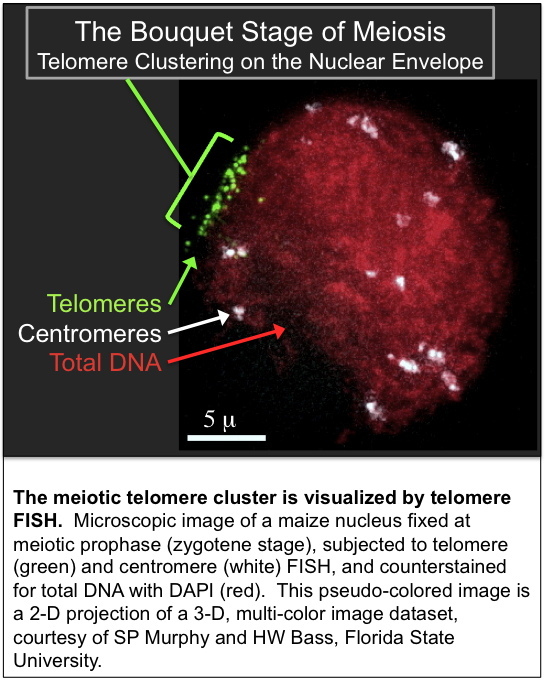 Functional analysis of meiotic telomeres: This research was intiated during HWB's postdoctoral research. Since then investigations have continued to focus on the role of the telomere bouquet in meiosis. 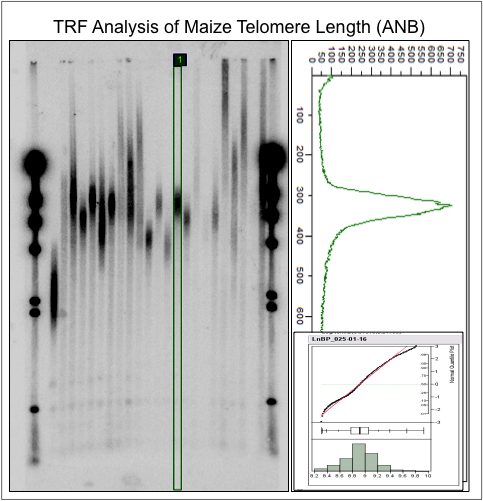 Research led by postdocs, graduate and undergradaute students at FSU has led to the identification, cloining, and characterization of genes encoding maize telomeric proteins, the characterization and cloning of meiotic mutants with meiotic telomere-misplacement phenotypes, QTL mapping of genetic factors that control variation in telomere length, and the analysis of the meiotic nuclear envelope, SUN domain proteins, and the LINC complex in coordinating the cytoplasm-nucleoplasm interactions that control many aspects of chromosome behavior in meiotic prophase. The Cytogenetic Map of Maize project employs an innovative technique based on transgenomic FISH mapping with maize marker-selected sorghum BAC probes on maize meiotic fibers that are visually isolated by chromosome painting in an oat genome background. The Chromatin Structure and Genome Response in Maize project combines genome-wide microarray analysis with 3D microscopy using novel assays to characterize the nuclesomal and chromatin accessibility landscapes in the maize genome in response to genetic or experimental manipulations. This team project includes investigators from FSU (JH Dennis, JM McGinnis) and Florida A & M University (O Onokpise). More information on the research projects can be found on the Research page. - 3D Images of desynaptic (dy, dsy1) mutants. - TGMV geminvirus intranuclear localization.